In keeping with the theme from my recent post about Brownfield Redevelopment I’ve realized that I need to write dedicated posts about the individual Phases for assessing contaminated land. These Phases are very unique and I can appreciate the work involved to complete each of them. Its really worth spending the time to describe each, since they are so detailed. I’ve also realized that there aren’t many websites out there that are user friendly and accessible to the public with good links to the resources needed to conduct projects such as these. I’m hoping that as I develop these posts I can keep a catalogue of reference material for people like consultants to use in the future to help them learn about these types of projects and to be a library in a sense, which is really the spirit of the website. The Phase One ESA is really the backbone of the environmental due diligence consulting industry. It all starts here and is really (to me) the most interesting portion of the whole assessment process. Its interesting to me because every new site and Phase One tells a different story about a property’s history, how it was developed, who/what business lived there, what did they do, and what impact did they have on the land. Some Phase Ones tell a very short and lonely story (maybe about an old farm house on some agricultural land) and some Phase Ones tell a long intriguing story about maybe an old bulk fuel storage facility, old gas station, or manufacturing plant, or a combination of many activities, some of which could have had environmental activities like illegal dumping and spills which lead to further investigation…doing a Phase One its kind of like being an environmental sleuth, looking for clues from the past that will help you solve some kind of environmental mystery. Phase One ESAs are conducted for a number of different reasons. For the most part banks or financial institutions trigger the need for a Phase One to be done to determine if they are lending money on a property that may be dirty and possibly become a liability for them…if they were ever to be the receiver of the land through a possible bankruptcy per se. Its really the beginning of a transactional environmental due diligence process (if transactional is even a word). This is done as part of the redevelopment of a property, refinancing of a property, divestment or acquisition of a property to determine if there are any areas on that subject land that could carry any inherent environmental liability. In simpler terms, the objective is to find out if there is going to be anything in the land that could harm or cause an adverse effect to anyone or anything that occupies the property (people, animals, trees, etc.). The standard Phase One that is used for day to day business/property transactions. This type generally follows the Canadian Standards Association (CSA) Standard “Z768-01 (Reaffirmed 2012) – Phase I Environmental Site Assessment“. Because this standard is a private document I can’t post a link to it, but here is a link to the CSA website where you can buy it http://shop.csa.ca/en/canada/environmental-auditing-and-related-investigations/z768-01-r2012/invt/27015182001. If you email me at northenvironmental@gmail.com I will lend you a copy of mine. The MOE Ontario Regulation 153/04 (as amended) version of the Phase One ESA that is used for filing a Record of Site Condition. This type of Phase One is somewhat different than the standard version as the requirements of what is completed during the assessment is strictly defined by the MOE. A copy of the MOE’s guide to completing a Phase One ESA to the regulated standard is here http://www.mah.gov.on.ca/AssetFactory.aspx?did=9278. No matter what type of Phase One you are intending on completing they both have the same objective which was stated above…to find out if there are any environmental liabilities associated with a specific piece of land. They both also have the same four fundamental components: 1) a visual inspection of the property; 2) a series of interviews with people that are knowledgeable about the property; 3) a review of records and documents pertaining to the property; and 4) the compilation of a Phase One report. The main difference between the two is that the regulated version (for Brownfield Redevelopment purposes) is very strict in terms of what and how the fundamental components are completed and evaluated, i.e., more intensely scrutinized and defined. Inspections of the property are typically walkthroughs that looks for obvious signs of contamination or hidden liabilities like vent pipes for underground storage tanks or surface staining from leaks and spills. Interviews are usually done with the property owner, or someone that is very knowledgeable about the property, in hopes of finding out what they know happened there over the years such as who the previous occupants were or history of tenants (and hopefully they are truthful and honest about it!). A review of records can include a huge database of information, most typical sources include aerial photographs, fire insurance plans, insurance reports, waste records, MSDSs, and public records with the MOE, TSSA, and local Municipality (just to name a few). The report itself is basically that. All the findings that the assessor discovers is laid out into some form of a written report. Like I mentioned before I’ve seen a wide range of interpretation of what is thought to be needed to be contained in these, some are 3-5 pages, some are over 1000 pages. All of them have a conclusion though and that is whether or not the property is or might be contaminated. Generally at no point does a Phase One complete any intrusive soil or groundwater testing of a property. And on many occasions the Phase One undergoes a review of the property’s assets to determine if there are any harmful building materials, such as asbestos, that might be of a concern. Variations of the Phase One have been seen to include limited versions of these testing such as this but are not always normal practice. For the sake of the reader I’d like to comment on the general cost and timeframe to complete a Phase One…but I don’t want to be misleading anyone so I make the caveat known that there are many factors that can affect the deliverable such as: where the property is, how big it is, how much history it has, how many records need to be reviewed, etc. However, as a ballpark I’ve seen the median range (excluding the outliers) go anywhere from $1000 to $5000 for a standard Phase One and shouldn’t take any longer than a week to a month to complete. I won’t comment on the time and costs for the regulated RSC version of the Phase One since there are so many factors in making those determinations (you can always email me offline if you are looking for some guidance with that). As I mentioned before, what I like most about Phase Ones is their story that they tell. I’ve read and written some that tell tales of gross negligence leading to the ugliest contamination…and I’ve read and written some that tell stories about legendary companies developing a piece of land to build their empire in industry and manufacturing, and how they toiled to clean up their land from their past activities, only to bury their dirty secrets somewhere safe in a landfill so no one will ever find them…If there is anything romantic or thrilling about environmental consulting…its the Phase One…I’m glad I was gifted with a good imagination or else it would make my day job pretty boring. Once the plant uptakes the contaminants what do you do with the organic matter of the plant? Do you harvest it and landfill it? Is the organic material contaminated (it says harmless byproducts above but what are they)? Is phytoremediation a remedial plan that is used like a barrier to prevent contaminant groundwater migration beyond where the plants are uptaking the chemicals? Trichloroethylene (TCE) is a dense non-aqueous phase liquid (DNAPL) and will likely reside deep into the aquifer…how deep do plant root systems go that can uptake the contaminants? Can they extend through confining layers in the subsurface and reach the confined aquifer where DNAPLs might exist? Or are they very limited to the shallow unconfined aquifer? Cool idea as a long term attenuation approach to remediation or maybe as a risk mitigation measure…but might not be a practical solution for fully remediating a contaminated property. Recycling Coke Bottles and Newspapers…Why Not Our Land? What is “Brownfield Redevelopment”? Its hard to explain what this is without putting someone to sleep so I will try to jazz it up a bit…think about the crappiest piece of derelict property you remember as a kid that might have seen being used as an old wrecking yard, factory or gas station…now envision it in your present local downtown streets, maybe next to your favorite Starbucks or a friend’s apartment. All that’s left is a dusty skeleton of its past, maybe a few old condemned buildings left behind, a fence put up along its perimeter hopefully keeping the vandals out, a couple weathered signs that stay “No Trespassing”, garbage littering the ground…This could be potential Brownfield Property. What makes these properties concerning is that they could have serious environmental concerns associated with their historical operations, which may pose a health and safety risk to the public. However, when dealt with correctly these derelict properties are valuable as they may potentially be reused for another generation of business. Maybe that vacant ‘dive of a property’ next to your favorite watering hole is redeveloped into a luxury condo building or a new university residence or maybe a nursing home or park. All of which would be an overall improvement to the property, an increase in the tax base for the municipality, and possibly an increase in the surrounding properties real estate value. If these old properties are contaminated, then they need to be cleaned up before they are reused for certain applications (i.e., an old commercial property into a more sensitive land use such as residential). The process in which these properties are determined to be clean or dirty, and how they get cleaned up is the real challenge as there is regulatory red tape and hoops to jump through. In a nutshell, in our Province of Ontario you cannot redevelop these types of properties for certain land uses without firstly obtaining what’s called a Record of Site Condition (RSC). To get an RSC you must comply with the requirements of Ontario Regulation 153/04 (as amended, http://www.e-laws.gov.on.ca/html/regs/english/elaws_regs_040153_e.htm). Its not an easy or quick process. In the simplest of scenarios it can be somewhat costly and take a few months at least. If not planned for correctly, it could result in a significant delay in development plans. The process starts with what is called a Phase One Environmental Site Assessment (ESA). This process is generally a desktop review of the property with the objective of determining if there is any actual or perceived contamination to the soil, groundwater or sediment on-site. For example, during a Phase One, the person assessing the site would (as a small portion of the process) review historical building records or aerial photographs that might indicate the presence and location of underground fuel storage tanks or a gas station canopy. These types of issues would be deemed as Areas of Potential Environmental Concern (APECs) and warrant needing a Phase Two ESA before you can get your RSC. Without getting too specific, the Phase One ESA is a very detailed and thorough process which follows a specific set of criteria that is defined by the Ontario Ministry of Environment and Climate Change (MOE). At the end of the Phase One ESA process, the assessor determines if any APECs exist. If so, the project requires a Phase Two ESA to be completed prior to obtaining the RSC. If no APECs are discovered during the course of the Phase One, the property owner can then file for an RSC within the MOE’s Brownfield Environmental Site Registry and becomes a public record. If a Phase Two ESA is required to investigate the areas of concern (e.g., gas station underground storage tanks) some environmental testing is required. The amount and type of testing is scripted by the MOE in the Regulation as well as what the assessor defines (the assessor is the person who is reviewing the condition of the property, also referred to as the Qualified Person (this needs to be a licensed Professional Engineer or Geoscientist)). Phase Two activities may consist of a series of soil test pit excavations or boreholes using a drill rig with some groundwater monitoring wells. Environmental soil and groundwater samples (and sometime sediment samples depending on where the property is located) are collected as part of the Phase Two process and analyzed at a laboratory for certain chemicals and parameters. The lab data is then compared to criteria defined by the MOE. This criteria is established by the MOE using toxicological human health and ecological information. If the lab data analyzed from the samples collected from the property are greater than the established MOE criteria then there is so called ‘contamination’ on the property that needs to be dealt with prior to obtaining the RSC. On the contrary, if all the samples collected during the Phase Two come back from the lab below the MOE criteria, the assessor has determined no further work is required to assess the property and the owner can file for RSC with the MOE. There are a number of ways to deal with the contamination. It can be dealt with through either various forms of remediation or through risk assessment, and in some cases a combination of both. Once the contamination has been remediated or deemed safe to be left on-site through the use of a number of risk mitigation measures, and that all further sampling requirements have been met to satisfy the Regulation, an RSC can be obtained. Once that RSC is obtained, the owner has satisfactorily met the requirements of Ontario Regulation 153/04, and can proceed with development of the brownfield property (barring all other municipal or regulatory requirements have been met). There are a number of reasons why an RSC is or may be required. I’ve only touched on one for the topic of this post (i.e., to redevelop a brownfield property for a certain use). Phase One and Two projects and the work involved in obtaining an RSC are highly variable. The objective of this post is only to provide a brief overview of the process only and is not intended to simplify or downplay this process. It is recommended that significant consultation with all stakeholders is completed prior to taking on a brownfield redevelopment project (municipality, environmental consultant, property owner, MOE, etc.). The costs and time to complete the process of obtaining an RSC can vary significantly from site to site. Over the past few years I’ve seen the costs and timeframe to obtain an RSC under the most basic conditions be just below $10K and approximately 2-3 months from start to finish. These projects are also known to range into the millions of dollars and extend over the course of a couple years. These cases involve significant remedial efforts, risk assessment and lengthy review consultation periods with the MOE. For the utmost reason, to protect human health and our ecosystem for the people who use these properties and for our future generations. I encourage the development of brownfield property. I think its an exceptional idea. We recycle anything from our coke bottles to newspaper….why not our land? It seems here that there might be a lot of assumptions being made possibly leading to finger pointing and illegitimate accusations without having going through a detailed hydrogeological assessment to confirm these findings. Nonetheless there is certainly the possibility which shouldn’t be ignored. I like this article because it’s controversial and brings up a lot of interesting questions to think about. Where I’m from (Sault Ste. 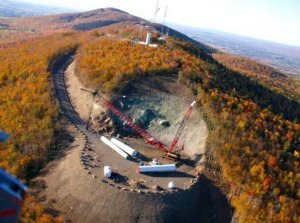 Marie, Ontario) we have our third wind farm being built plus several very large solar farms. Not to mention several other large local development/construction projects being completed over the past few years. Albeit some of these large construction projects may not be within our groundwater recharge zones and have no bearing. Nonetheless over the past recent years our local water utility company has switched to a chlorination system which has resulted in significant discolouration of our water supply in certain areas of the city. Is there THMs in our water supply? Is our soil in the Sault highly organic and susceptible to causing a similar situation as found in this article? Does anyone know or have looked into this? Environmental food for thought…. The implantation of a wind turbine causes a significant impact on the land, on nearby water courses (sedimentation etc.) and on the water supply (filtrations into the soil). This particular picture is from the US. “The radiologist, 58, said: “I obtained test results in 2013 from East Ayrshire Council and discovered that our water had been grossly contaminated with E.coli bacteria. “That was bad enough but I am far more concerned about the presence of THMs in the public supply. “Last week, MSP Graeme Pearson met Scottish Water’s director of strategic customer service planning, Professor Simon Parsons, to discuss Dr Connor’s findings. When someone asks me what I do for a living I usually just politely tell them that I clean up gas stations and leave it at that…its seems like the general public has been aware of property environmental contamination long enough to understand that these types of people exist and I’m one of them. It can be hard to explain to people what I do, its even harder to explain why I like it and how it keeps me interested…I’ve been online seeking someone or something like me that would share this same passion or at least be putting some relevant and interesting information out there about environmental engineering in a cool and exciting way to keep my attention for longer than 5 minutes. So far no luck…in hopes of finding that special group of people I intend to put myself out there by creating these posts in order to attract some discussion and to share what I have learned with the intention to bring some insight into the industry. Environmental engineering is a broad term used to describe a relatively niche field of work…so at this time, to be specific I will focus this blog and my posts on what I am most familiar with and what I know best…’contaminated sites and remediation’. What I like about these projects is that they are all different. They all tell a different story. And at the end of the day, most of my projects usually end up in doing some good, either by helping someone out with their business goals or by cleaning up the environment, and more often than not a combination of both. Some of the work I do also comes with a bad stigma. There are a lot of people out there who have heard those classic environmental horror stories about businesses going broke to clean up their property…some of them might be true, most of them are exaggerated. I hope I can shed some light on these situations for everyone, clear up that stigma, and speak the honest truth through my experiences….